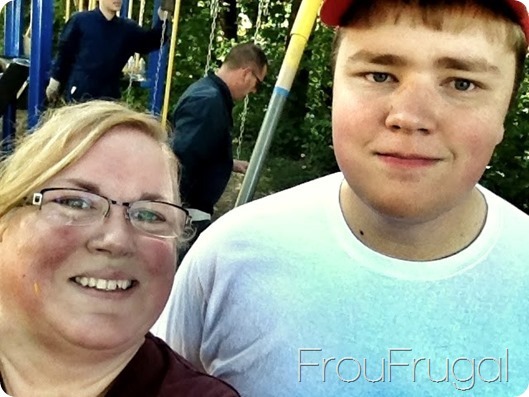 Sam was working at Firelands Scout Reservation in Wakeman, Ohio and not able to go with us. Noah worked there for a few weeks this summer and all last summer. It’s a great summer job. While we were at the zoo, one of the things I was simply blown away by was the eagle attraction. It’s hard to really understand the scale of how big these birds are and how massive their nests are. I don’t know how big the one is in Columbus but an eagle’s nest is about 5 feet in diameter and can often get up to 9 feet big. The one in Columbus just struck me for how huge it is and you really are quite close to it. Their nests are made of large sticks and limbs that are stacked together a piece at a time to form a place of rest for the birds. It doesn’t look very comfortable to me, but to each his own. 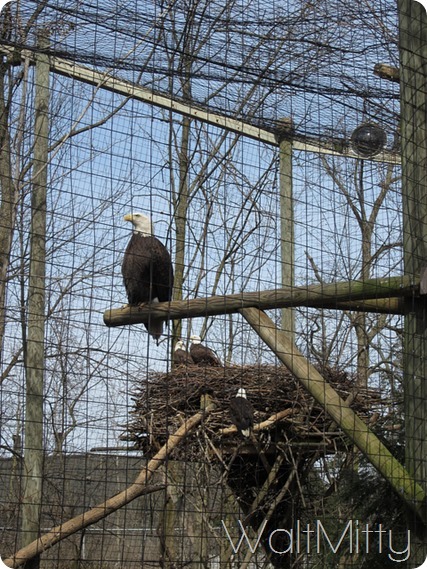 The Columbus Zoo is not the only place that has an eagle’s nest. It turns out I have one, too, but our nest looks like this. The newest Eagle in my nest hatched this month. My two other Eagles look like this. 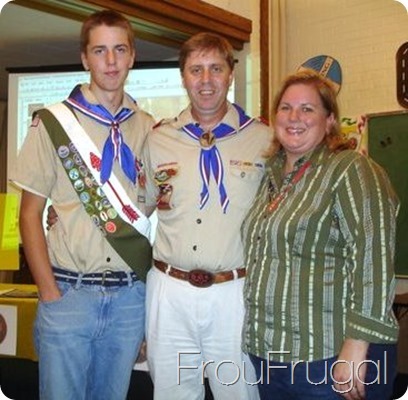 Both Nathan, our oldest son, and Hubs are Eagle Scouts. Did you know that fewer than 4% of all Boy Scouts end up earning their Eagle award? I can understand why. It’s not an easy process. 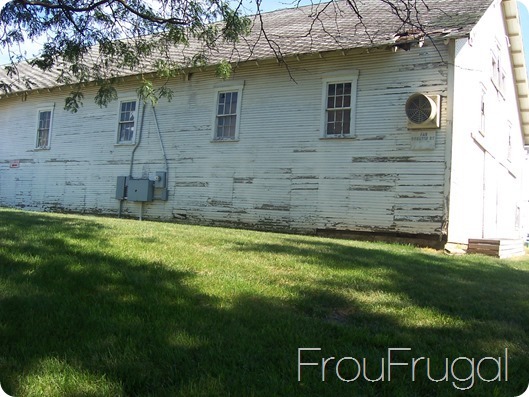 For Nathan’s project, our family and other volunteers painted a barn on the Miami County Fairgrounds in Troy, Ohio. It was a big project and pretty easy in terms of projects. Nathan was a part of a great troop. There was lots of parent support and a ton of activities. Even though Nate had finished his project when he was 15, it wasn’t until his senior year and we were about to move that we twisted his arm he hustled up and finished the process. Even with his heels dragging, it took us a couple of days to finish up what needed to be done. We ended up having his Eagle board of review (the final step in the process) in my bedroom on the day we were packing up the moving van to move from Ohio to Idaho. Back then, we thought that process was crazy. Noah’s path has not been as easy. In fact, to call it hard would be an understatement of enormous proportions. If I let it, I could become quite bitter about the choices certain people made to hinder Noah from getting his Eagle. People who should have been helping him. 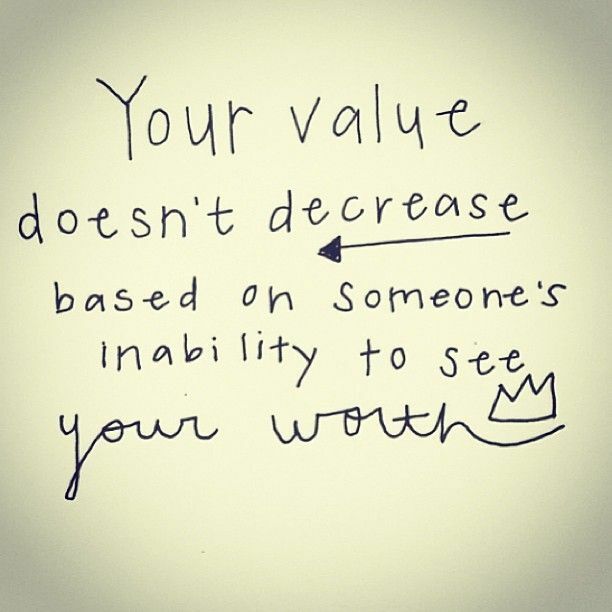 People who made this statement all too true for our family. Instead I will focus on the fact that in the end, people who were invested in seeing Noah succeed, recognized that he had done everything required of an Eagle Scout. 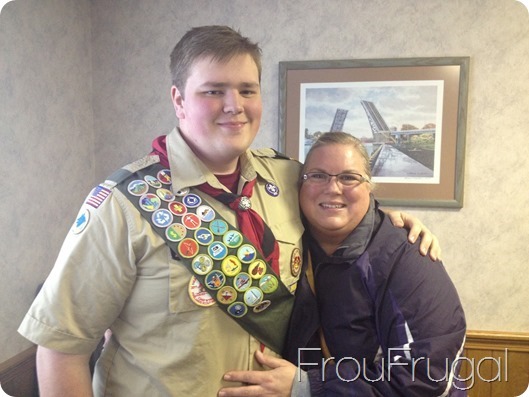 The board was “enthusiastically unanimous” in their decision to advance to Noah to an Eagle Scout. I love that he saw a need and wanted to fix it. 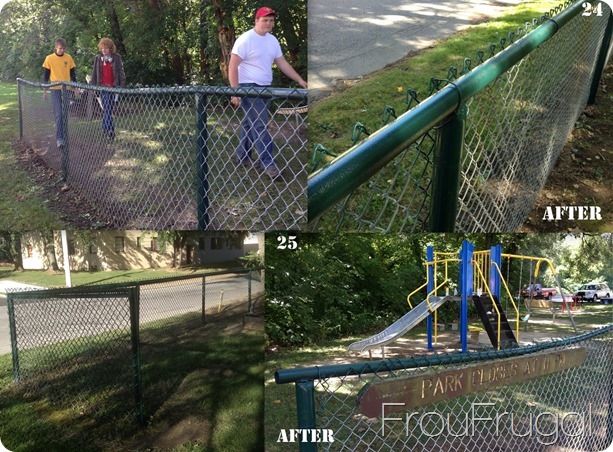 After working with city officials and gathering up donations from the hospital and the Independent Living Center, Noah led a group of 20 volunteers to fix Ritters Run park in Mansfield, Ohio. 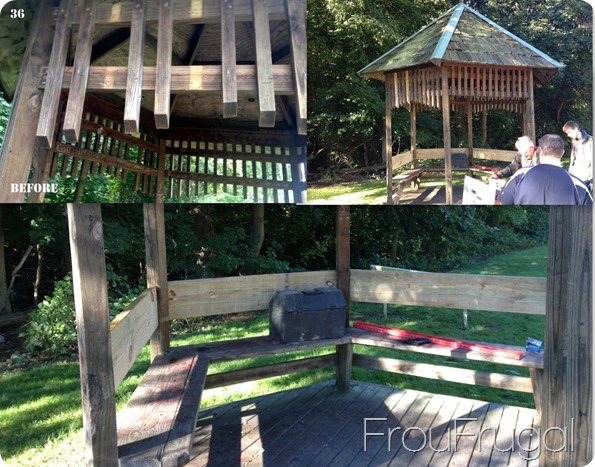 Here are the before and after shots of the project. Noah had people remove the weeds and add more sand to the box. 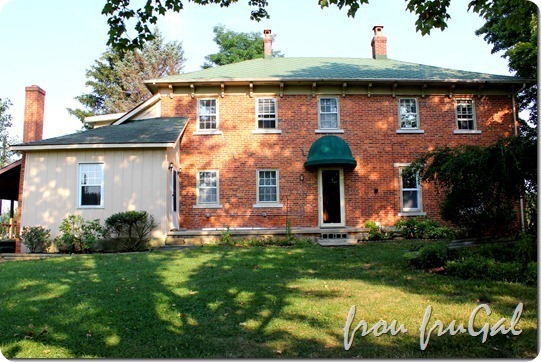 I had to leave the project early because I went down to Columbus to meet the editors of Country Living Magazine at the Country Living Fair that day. 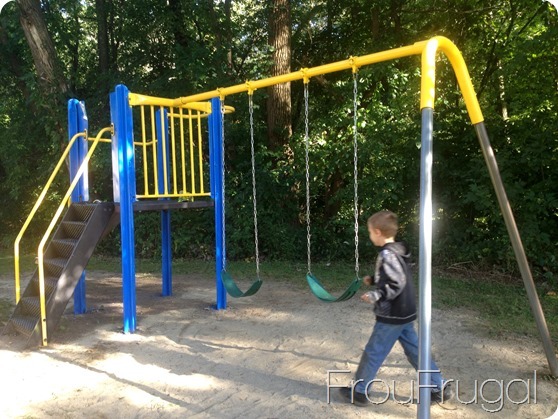 When I came back, the kids were playing in the sand box and were so happy with the changes to the park. They were all telling me at the same time their favorite park of the project, “We love all the sand!” “I love the red toy!” “We love the shorter swings!” It was very gratifying to see their excitement. 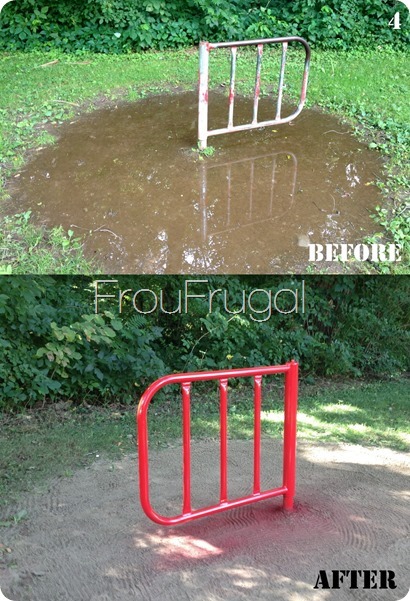 There was a serious problem with water under the toys when it rained. Between the time that we identified the park as a project and when we actually started to work on it, a local postal worker fixed some of that problem by taking sand from the sand box and putting it in places where water was gathering. Noah had the team add more sand to this area. 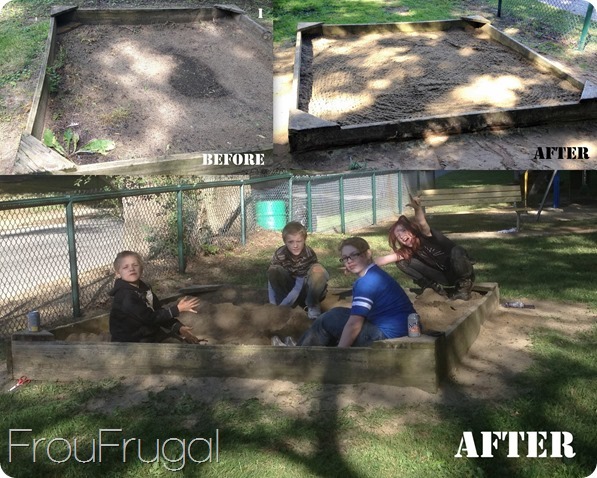 In fact, we went through 30 bags of sand for the entire Eagle project. 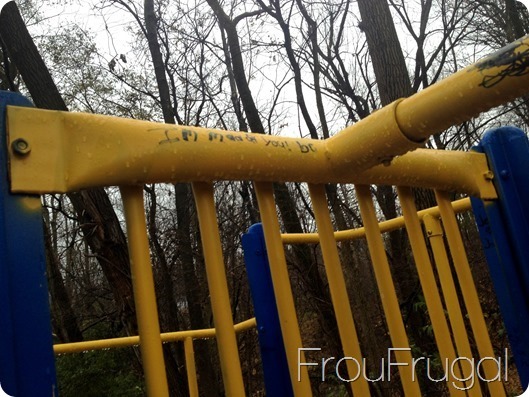 Missing slats and rotting wood and graffiti that helpfully identifies the local area code for those that are unaware also make for a vast improvements to the park. The city provided all the wood for the benches. You can’t use a water sealant on treated lumber for 6 months. 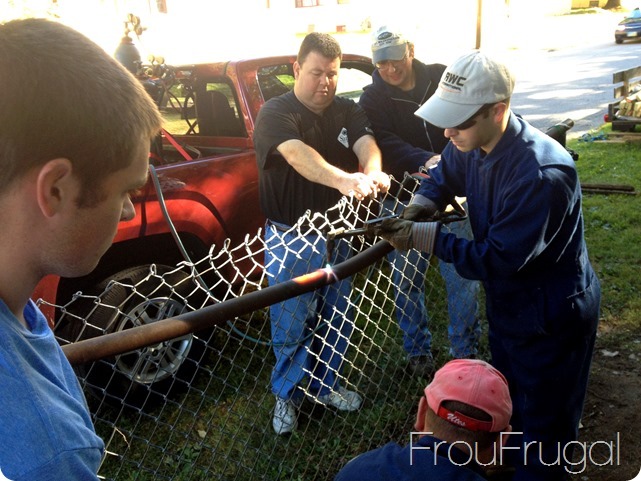 We plan to go back in the spring when the weather is nice and treat the lumber. Someone was apparently too “kool” to use a “c.” Noah had the team sand off the graffiti on the slide, repaint all the blue and yellow areas (after cleaning and sanding them down), add sand under the swings, and cut the plastic coating off the chain that was torn and cracked and hurt your hand when you held onto it. I spent a lot of time working on this toy. 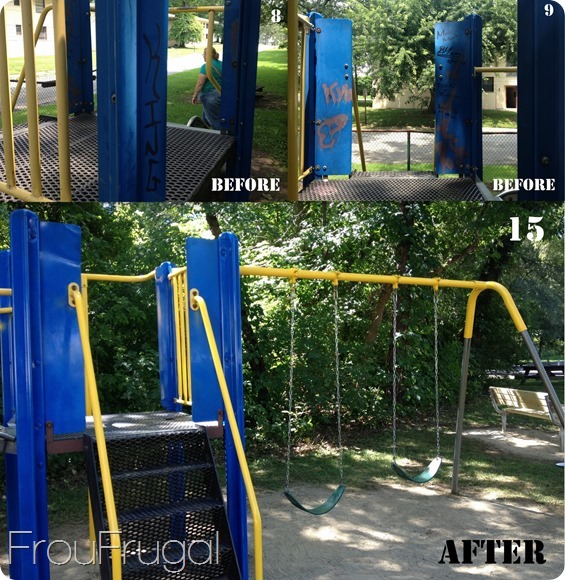 I painted all of the blue areas and most of the yellow parts, except for those that were too high for me to reach. I put Sam, my tall son, to work on those areas. This boy was so excited to show me how much he loved swinging on the swing after we’d raised the swing a bit. You can imagine my disappointment when I stopped by a month ago and found that some kids decided this toy made a good message center. Now, I’m not sure if it’s the first author or the second who then wrote: “Well I got 2 go 2 Jaxon’s house bc (because) Logan dumped water on my keyboard.” Again, it’s a toss up but I believe the other writer then responded with “The Little twerp!” So next time your computer is down, know that your local playground equipment makes for a fine substitute (sarcasm font – Activate!). Also, it’s obviously the appropriate place to make declarations of anger. “I am mad at you! bc” Either “bc” is the author or it means”because” in which case, the because is apparently so obvious that no further words are necessary. Tough call. 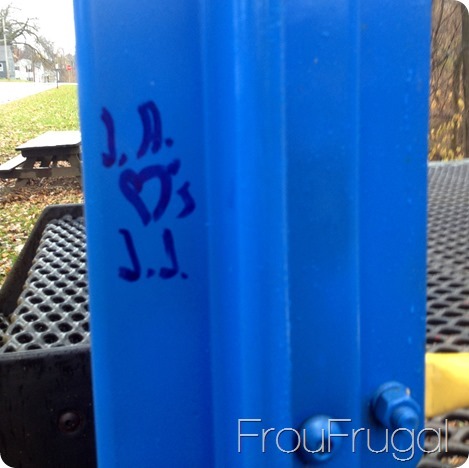 Playground equipment has always been a place for declarations of love. This one doesn’t make me nearly as cross and they did have the decency to use a similar colored marker to give the love message a nice tone-on-tone vibe. What can you do? We tried. 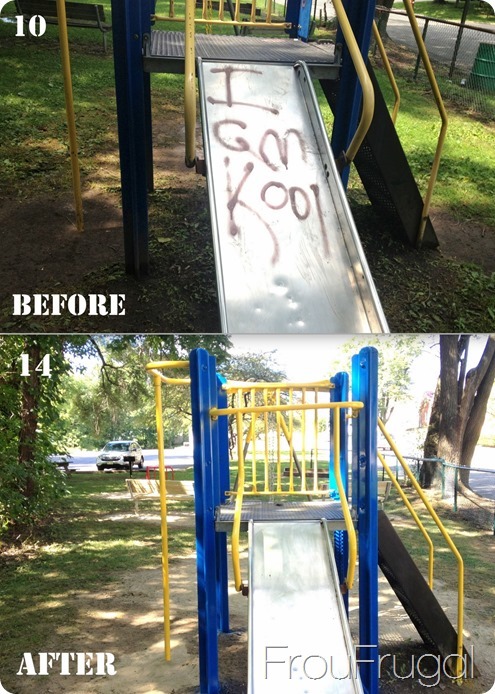 This park is in a low-income neighborhood with plenty of gang activity. I’m actually a little surprised it’s not worse. 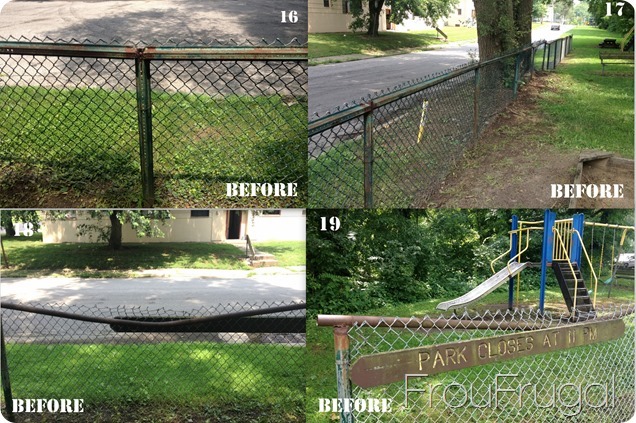 Some of the other projects Noah had people working on in the park were to repair and paint the fence. It looked like a tree limb crashed onto the fence at some point and made for an interesting fence line. One of the volunteers brought in an acetylene torch and they heated up the bent area. 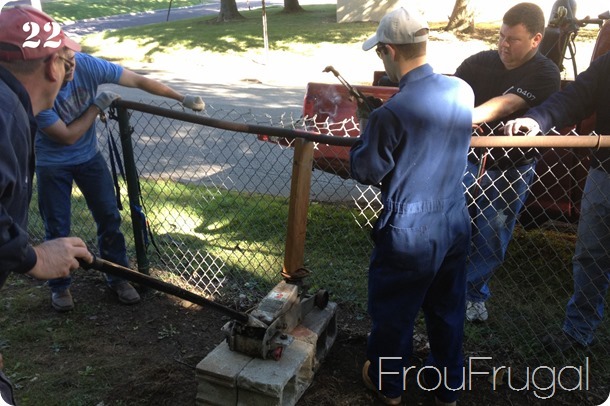 We then used some blocks, a notched piece of wood and a car jack to try to unbend the fence rail. Fairly McGuiver-ed, but a very ingenious solution to the problem. 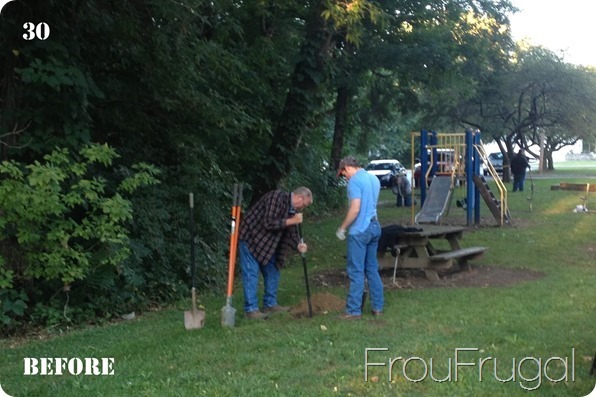 We had 20 volunteers show up to help with the Eagle project. Noah broke people up into teams to work on the different project areas. 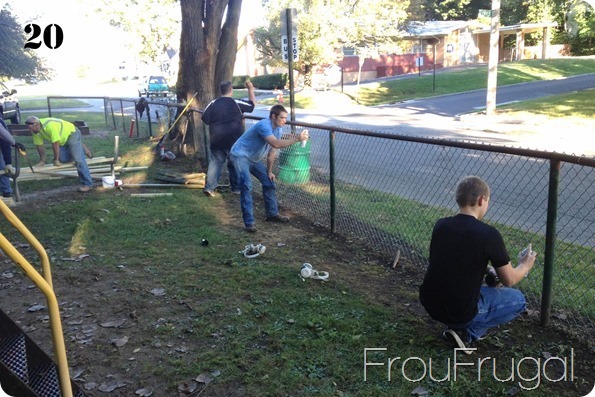 Here are some of the volunteers giving the fence a new coat of paint. 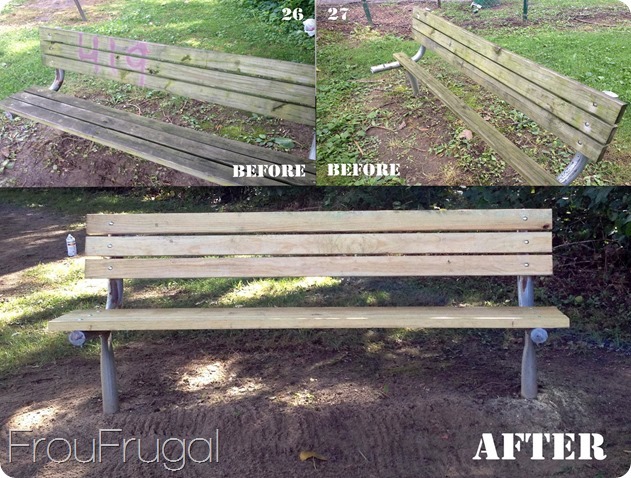 You can also see the bench repair progress in the background. Noah organized a team to fix up a gazebo in the park. It needed back supports behind the benches to strengthen the structure and to give people a place to rest. 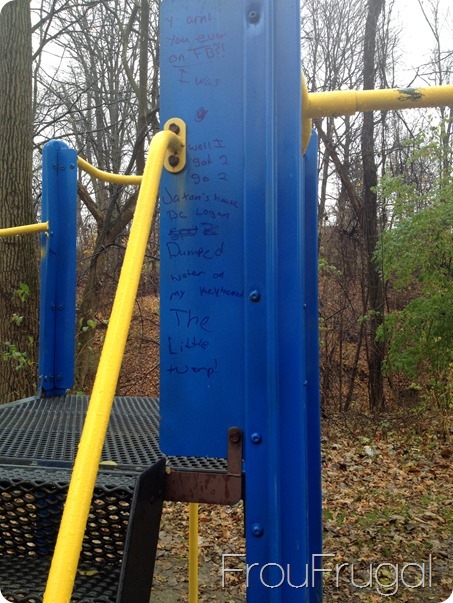 There were a couple of decorative pieces missing and a whole lot of graffiti on the inside of the gazebo. Finally, there were two picnic benches in the park and Noah had Grill Team that moved one of them to a better location and then installed grills by each table. The park doesn’t have water so Noah came up with a plan to bring one of our 50 gallon barrels of water to the park and they used a rubber tote to mix up the cement for grill when we realized we’d forgotten a wheelbarrow. The city provided the grills for the park. 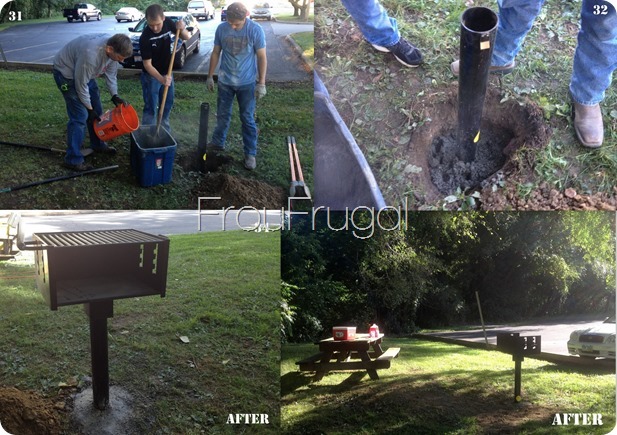 We christened one of the grills by roasting hotdogs and having a picnic lunch for the volunteers after we finished up the project. 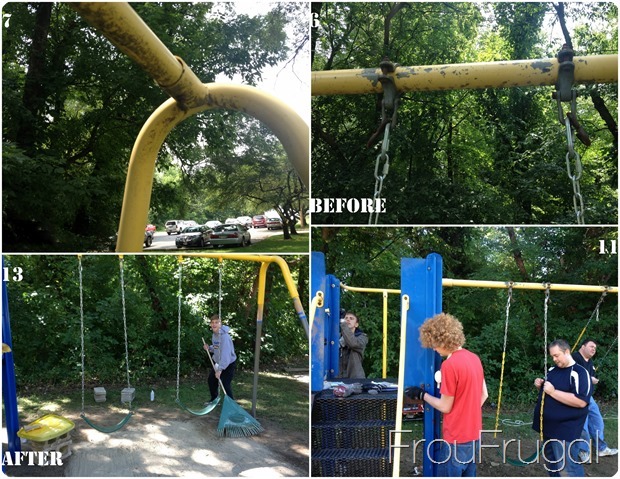 Finally, here was also a lot of general trash removal (six huge bags) and park clean up that Noah had to organize and coordinate. He had to manage a lot of people doing different things and he did a great job making sure everything got done. There were a lot of details to figure out and coordinate for this project. Noah had to track down city officials and park’s department employees to come up with a plan. He had to raise money to buy the supplies that the city didn’t provide. Even though we had some general “sure we’d like to help” response from a couple of places, getting the final approval for the money was a challenge. Noah literally got the final okay for a big chunk of his money at 11 p.m. the night before the project. With a discount from Home Depot and Lowes, who sold things to us at cost, it all turned out fine in the end. Noah truly is one of my heroes. He could easily have given up in his goal to become an Eagle at any point in the last six months. He had more challenges than most to accomplish this goal, but he kept pushing through and he did all the work to earn his Eagle award. 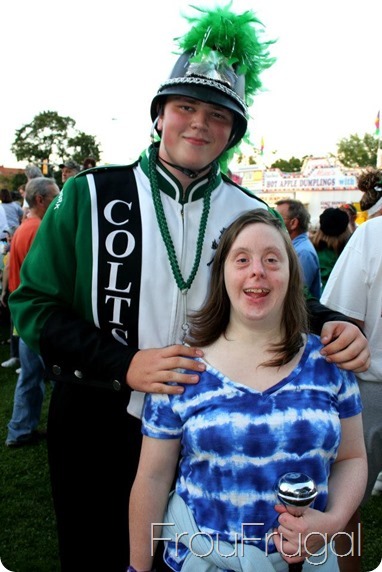 Many people who wrote letters of recommendation commented on Noah’s interactions with his aunt, Katie, who has Down syndrome and lives with our family for most of the year. Noah was initially very reluctant to have Katie in our home. After about a month of her living with us, Noah realized how much Katie enjoyed seeing him and Sam do things and how fun it is when Katie smiles. It became Noah’s mission to help Katie smile every day. 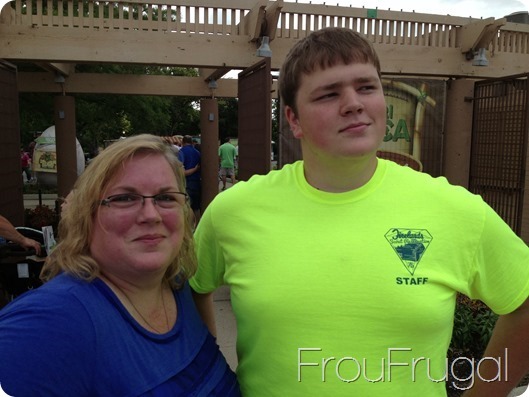 He is such a great young man and I’m so grateful to be his mom. Here is a video that Hubs put together to celebrate Noah’s accomplishment. We have one eaglet left in our nest. Sam is working on some required merit badges for his next rank advancement. We are hoping to get everything done that he will need for his Eagle, except for the project, by the time we move to Utah in June. I am grateful for my good husband who has taught our sons to be such wonderful young men. They all are involved in the community and do a great job of serving others. 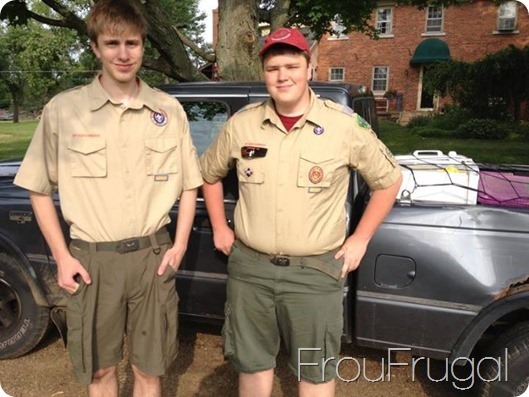 They live the Scout Law and it is a joy to be their mom.